This time i am going to create very simple AJAX based visual force page for the beginners. AJAX is the art of exchanging data between server and client without reloading the complete web page. 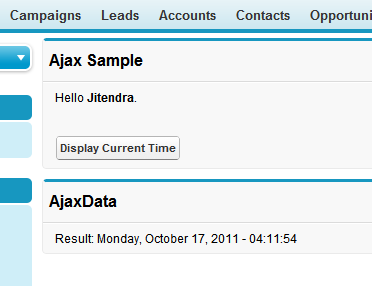 Visualforce has inbuilt support for the AJAX. using the attribute “rerender” we can specify that where the response should be rendered. Lets have an example to demonstrate that how simple AJAX works in visualforce. Create an APEX class with following code. As you can see in above Apex class, i have created method named “setCurrTime()” which will set the value of string variable. There is also one get method named as “getCurrTime()” which returns the value of that variable. On the basis of above Apex class lets create Visualforce page with below code. Apex class earlier created is referenced using attribute “Controller” of “apex:page” tag. On “apex:commandbutton” we have specified that after clicking on button which method of the class should be called using attribute “action“. After the action completion of commandbutton which part of the apex page should gets refreshed is specified by attribute “rerender“. iam very thankful to u sir for explain Ajax tutorial………….. This is by far the best explanation on using Ajax in VF. You should be consultant to SFDC documentation team. Hats Off ! Thank you so much sir for this post. Its very simple and give clear idea about ajax and Visualforce. This is one of the best description of Ajax based VisualForce Page on the internet, that I have come across . How its a method? and where is CurrTime Declared?